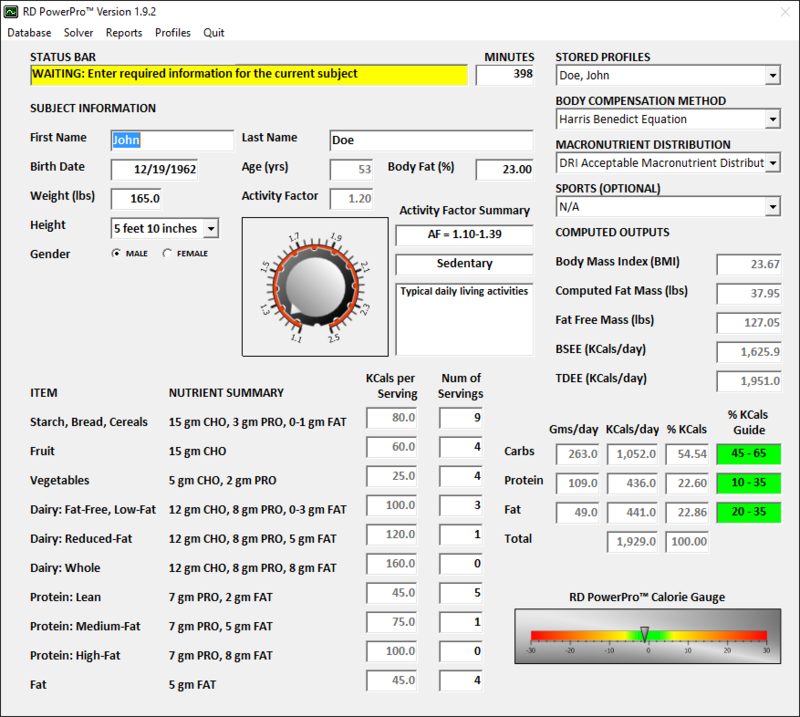 The RD PowerPro™ Software was developed by a Registered Dietitian FOR the use by Registered Dietitians. Develop customized diet plans for your clients that provide information with regards to total calorie levels as well as a breakdown of percent carbohydrates, protein, and fat. The use of our proprietary SOLVER algorithm which allows the User to instantly calculate dietary food exchanges that meet the client’s exact needs in terms of total calorie, carbohydrate, protein, and fat goals. The Integration of a SPORTS mode that allows for developing custom diets plans for athletes – including identification of total calorie, carbohydrate, and protein goals, hydration planning, and recovery nutrition needs. Includes Database operations (save, update, delete) as part of the Software License. Your client profiles will be saved on our MySQL server so you do not have to worry about backing up your data. Direct exporting of results to Microsoft Excel that are in a “ready to print” format. The output also includes your Company/Clinic/University information as part of our standard reports. We offer a unique full featured DEMO program that allows you to run the Software for approximately thirty minutes. The trial period will allow you to get a better understanding of how the Software works and experience the power behind the SOLVER feature. All data created and stored during the trial period is automatically available should you decide to purchase a Software License. Select the CONTACT US link on our website for more information on our DEMO program.